Lidia Celebrates America is all about tradition around the table. Superbowl Sunday is a truly American celebration where food traditions include spicy chicken wings, mozzarella sticks, chili and much more. At our table, we definitely give the foods an Italian twist and serve dishes like Egg Battered Zucchini Roll Ups, Baked Pasta with Zucchini and Tomato Sauce and Pork and Prune Kabobs. One of the favorites, however, is the Potato Pizza which you see below. Preheat the oven to 350 degrees F. Put the whole, unpeeled potatoes in a pot with water to cover by a couple of inches, and bring to a simmer. Cook the potatoes until they are easily pierced with a knife but not falling apart, about 20 minutes. Let them cool slightly, then peel, press through a ricer onto a sheet pan, and let cool completely. 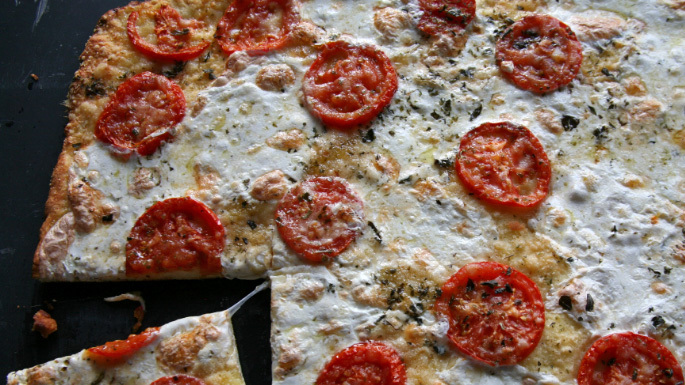 Top the dough evenly with the mozzarella, leaving a -½–inch border around the edges. Top with the sliced tomatoes, then drizzle with the 2 tablespoons olive oil. Sprinkle with the dried oregano and grated cheese. Bake until the crust is browned on the bottom and cooked through, about 35 minutes. Allow the pizza to cool on the baking sheet for a few minutes before cutting into squares to serve. –From Lidia’s Commonsense Italian Cooking (Alfred A. Knopf, 2013).